NO LAPTOP OR NO TUNING EXPERIENCE NEEDED! In the past, carburetor-to-EFI conversion was no picnic. At the very least, you would need a laptop and significant tuning experience. But thanks to FAST™ engineers, those days are over. With the new EZ-EFI® Self Tuning Fuel Injection System, you get patent-pending EFI technology that does all the work for you. Simply hook it up, answer the basic setup Wizard questions on the included hand-held display, and the system tunes itself as you drive! 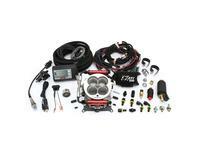 The new EZ-EFI® Self Tuning Fuel Injection System provides you with the complete EFI package, including the ECU, wide-band O2 sensor, wiring harness, fuel injectors, an optional fuel pump kit and other assorted components, including the innovative 4150 Throttle Body from FAST™. 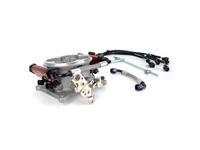 This cast throttle body gives you the total package for your existing 4150-type manifold and comes with everything, including the appropriate fuel injectors and fuel rails. For more aggressive applications, the EZ-EFI® Dual Quad Upgrade Kit is capable of supporting 1000+ horsepower engines with dual quad carburetor-type manifolds. In addition, the Multi-Port Retro-Fit EZ-EFI® allows owners of multi-port fuel injected applications to experience the benefits of EFI with no limit on horsepower because the system is based on each customer's supplied injectors. Regardless of your brand or size, this system bolts-on easily to any carbureted engine with up to 600 horsepower – NO manifold replacement needed. In addition to matching any carbureted manifold, the EZ-EFI® Self Tuning Fuel Injection System also works with your original carbstyle throttle linkage and is ready to accept all OEM sensors. 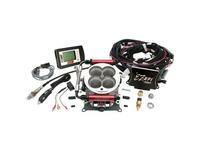 The EZ-EFI® can be installed easily in an afternoon and is a "must have" for your street rod or muscle car. The FAST® 4150 Throttle Body delivers the total package approach for anyone with an existing 4150-type intake manifold. 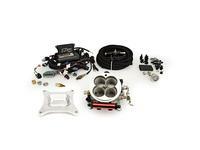 Everything comes with the kit, including appropriate fuel injectors and fuel rails. 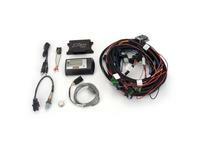 EZ-EFI 30227-06KIT Self Tuning Fuel Injection System Master Kit NEW! The EZ-EFI® Master Kit with In-Tank Fuel System features all the benefits of the original EZ-EFI® Master Kit, but also comes with everything needed to install an in-tank fuel system.